When I clip into my bicycle pedals each morning, I have no idea what is in store for me. Sometimes the days are pretty ordinary, and on others things happen that I could never have foreseen. Those are the times to seize the moment. 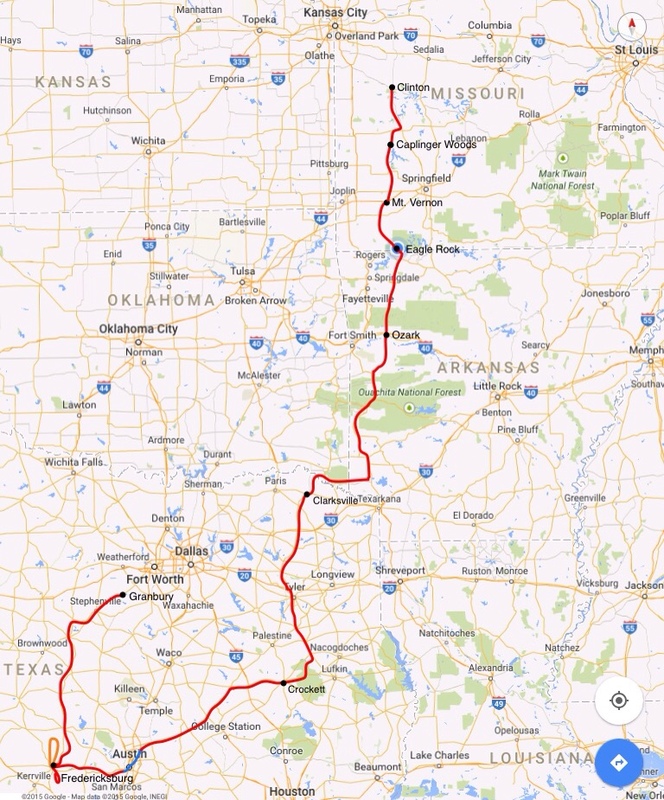 Having left the Ozark Mountains behind, our route took us north through the western side of Missouri to begin the Katy Trail. There were no particular sights on our itinerary at this stage. But traveling the back roads being propelled by the same south wind that plagued us early in the trip was extremely pleasant. 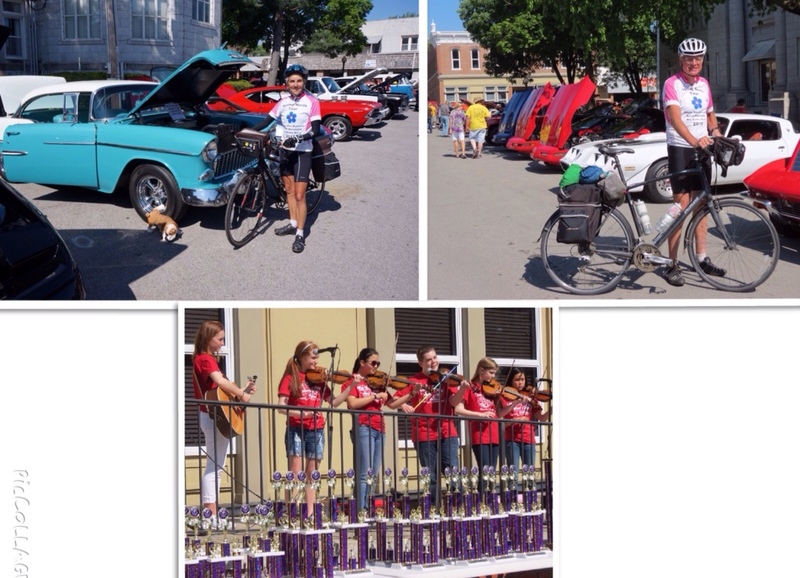 After a morning breakfast stop in Cassville, we expected to hit the road again. But a sign reading “Car Show” soon diverted us. There lining the streets of the town were rows of classic cars. It was a sunny warm day, and strolling along looking at the cars was extremely pleasant. I didn’t have to be a car fan to enjoy the spirit of the moment and the festive air in the small town gathering. A group of young people were playing fiddling music, which added to the ambiance. It felt great to be in the right place at the right time to partake of this show. That very same afternoon, pedaling along an undistinguished section of road, Rich suddenly began gesturing toward the sky. There we saw a parachutist just about to land. 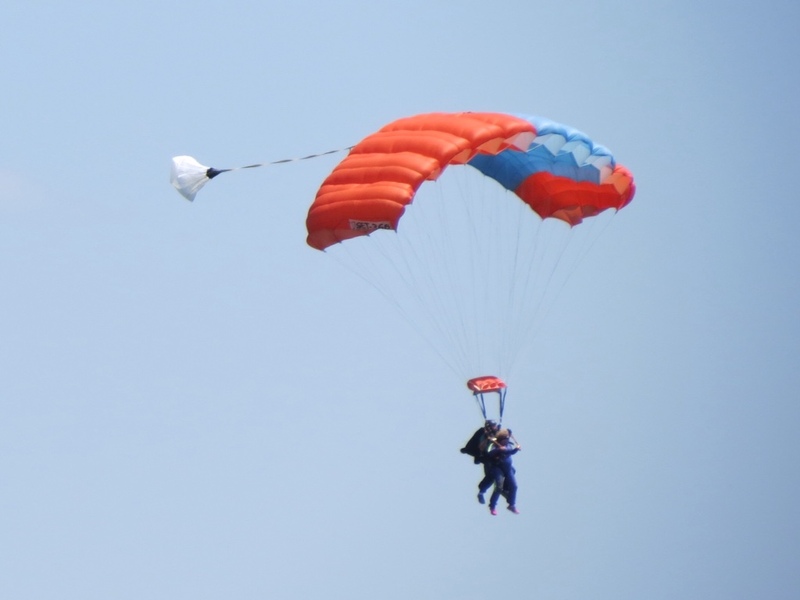 Not long after his colorful chute collapsed on the ground, I spotted a second one in the air. This time we were able to get our cameras out in time. We happily hung out on the roadside to watch the second one descend, which turned out to be a pair of jumpers. Their target was actually an airfield, and the small plane land soon after they did. It was quite the air show! Sometimes opportunities are of a very different nature. 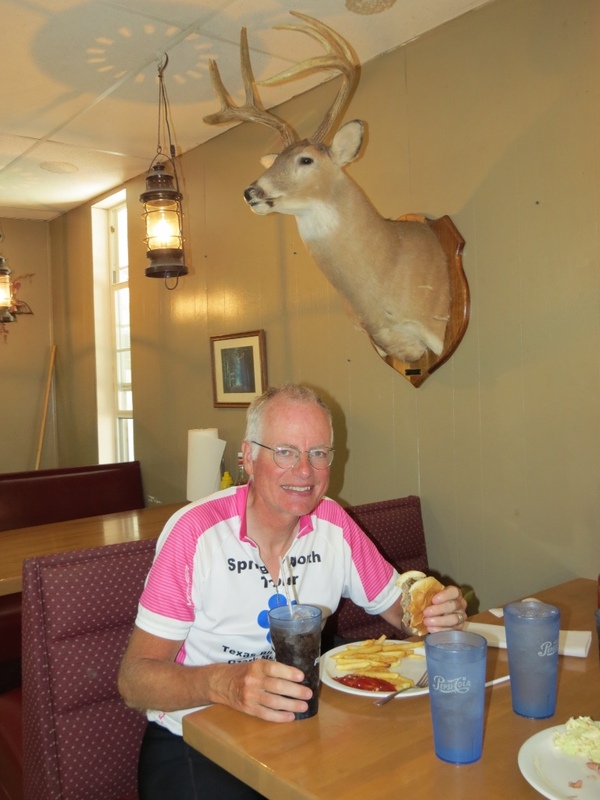 One of Rich’s prime adages about cycle touring has to do with meals. “When food is available, EAT!” is his motto. It’s a lesson he’s learned the hard way, when we’ve come up hungry by incorrectly assuming food will be available when we want it. So when we arrived at our campground at 2:00 in the afternoon and discovered the only restaurant within miles was about to close, we quickly ordered meals. Never mind that Rich had just consumed a burger and fries an hour before, and I’d downed an ice cream cone. This was our dinner – just way early. Oddly enough, it tasted great and carried us through the entire evening. We camped on a yurt that night by the Sac River. I wandered down to the river as I explored the area and saw a dam and a bridge just upstream. Looking more closely, I noticed some young men fishing with a net. I was memorized watching them throw the net and reel it in – an entirely different way of fishing than I was used to seeing. I’m still working on my photography skills, so I took the chance to practice and was pleased to be able to capture the whole sequence. I love campfires, but there’s no chance of carrying firewood on a bicycle. 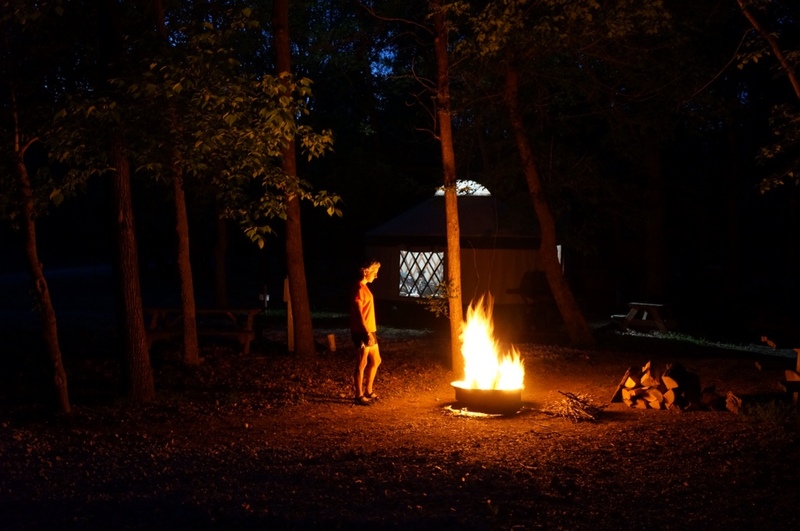 So when the campground caretaker showed up at our yurt with a load of firewood, it was a gift too good to turn down. He even gave us his lighter to start the fire. Soon I was off in search of kindling and donated my old maps to the cause. The evening was mild and dark, and as we sat on the extra logs by the fire we could see the full moon rising behind the trees. The crackling of the fire was accompanied by frogs croaking by the river. Tomorrow’s another day on the bicycle. I wonder what new opportunities might be in store for me? Fully enjoying your adventures….thank you for sharing your fun with all of us!